Our designers are definitely ready for Summer and hitting the beach with this beautiful Beach Combing collab. Whether you are scrapping romantic beach layouts, fun beach layouts, or beach scenery photos, this collab has items to cover all of that. You will love all of the unique elements and beautiful papers. If the bundle is too much for you, you can also grab the QP pack HERE, or the kit HERE. Here is a look at all of the items included in the collab this month. Don't forget about our NSD sales going on this week, since it is a storewide sale, the collabs are included in that. Regular price is $7.99 for the kit, $5.99 for the QPs, or $10.99 for the BUNDLE, but those will all be discounted for the store sales this week. 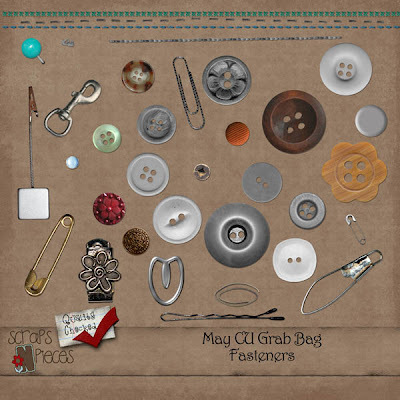 Our store CU Grab Bag this month is "fastenating" as Wendy put it in the newsletter. Our designers have 35 different fasteners that have all been quality checked and ready to use in your kit designing. This grab bag is also included in the store sales this month. We have all new monthly challenges in the forum starting today. The Out of This World Bits N Pieces are all on sale for just $1 this week. There are tons of contests, events, challenges and prizes for our NSD celebration this week as well. Be sure to stop by the forum and see how you can get your piece of the stuff being handed out this week. Lori Have a great day!